To the east of Jersey, La Déroute Channel separates the island from the Cotentin Peninsula of Normandy. The channel is c.25 km (c.15 miles) wide and contains the reefs and islets of Les Écréhous, c.5 km (c. 3 miles) to the north east, and the reefs and stacks of La Chaussée des Boeufs c. 5 km (c.3 miles) to the south east. This south eastern area, from La Rocque via Seymour Tower and La Chaussée des Boeufs towards Granville forms the shallowest part of the channel at low water spring tides and was the last part to be covered during the last sea level rise c. 5000 years ago. Geological setting of Jersey, its reefs and the western Cotentin (Normandy); Brioverian shales (pink); igneous/metamorphic rocks (reds); Palaeozoics (green/brown); Eocene limestone (yellow). La Carte Géologique de France, 2003. The geology of the Cotentin Peninsula, the nearest area to Jersey shows rocks ranging in age from the Proterozoic Brioverian (from the type area, Briovère, the Gaulish name for St. Lô, meaning 'bridge over the Vire') to the Palaeozoic Devonian cropping out in generally W - E striking anticlines and synclines. These are down-faulted alongside each other by generally striking NE - SW faults, which in some cases are illustrated as eastern extensions of the strike-slip shear zones and part of the St. Malo Terrane in the Brittany area (Brown, Power, Topley & d'Lemos, 1990, p. 183). The area is also affected by NW-SE striking faults and can be divided approximately into two geological halves. 1. WNW - ESE through Mortain and Domfront. 2. W - E in an arcuate outcrop east of Granville to Clécy in La Suisse Normande. 3. W - E from the coast to beyond Coutances (towards the arcuate Granville - Clécy syncline). 4. NW - SE south of Caen around May-sur-Orne. These Brioverian rocks and the synclines of Palaeozoic rocks of this southern part are regarded as " l'autochtone" (autochthon - a terrane not displaced since its formation, in contrast to nappes) (Dercourt, 1998. p. 291). Their overall outcrop is terminated by large sinistral fault which, with a thrust fault further north west, strikes north east and indicates pressure from the north. These faults extend north eastwards from Brittany along with others closer to Jersey, with curved strikes varying from c. WSW to ESE and c. SW - NE. In Britanny, this pressure has caused three nappes separated by faults, namely, the Trégor, St. Brieuc and St. Malo Nappes, the last two of which occur in this part of Normandy to the north west of the autochthon. The associated sinistral tear and thrust faults indicate that the St. Malo Terrane has been displaced from NE to SW by a sinistral tear fault, while the St. Brieuc Terrane, on which Jersey seems to be situated, has been displaced from NW - SE by a thrust fault. The Mortain - Domfront syncline and the Granville - Clécy synclines are surrounded by autochthonous Brioverian so are "in situ", while the May-sur-Orne syncline is surrounded by Brioverian of the St. Malo Nappe which has been displaced to the SW by the sinistral tear fault striking NE - SW from Granville. Further north, Jersey seemingly on the St. Brieuc Nappe, has been displaced to the SE by thrusting from the NW along the thrust striking NE - SW from Coutances. The two faults both pass under the Jurassic and Permo - Triassic rocks west of Bayeux. Many other faults striking at right angles, between NNW - SSE and NNE - SSW, also displace the outcrops; these include dextral and sinistral tear faults. In the northern half of the Cotentin, from Coutances and east of Jersey northwards, Cambrian, Cambro-Ordovician, Ordovician, Ordovician-Silurian, and Devonian rocks occur in often fault bounded NE-SW striking synclines overlying the Brioverian of the St. Brieuc Nappe, and extending from under the Mesozoic cover south Bayeux to the coast. However, a Palaeozoic syncline striking around WNW - ESE seems to plunge south eastwards from the coast south of Cap de la Hague. The following information is taken from the second edition of the Normandy (Maine) field guide (Doré et al, 1987) and from field visits with the Geology Section of La Société Jersiaise. For the latter, the Section is indebted to Dr. Arthur Hill who has researched, organised and led field study trips to various sites in the three Palaeozoic synclines, from Mortain and Domfront in the south via Clécy in La Suisse Normande to May-sur- Orne in the north. In these areas of Normandy, although distant from Jersey, the Upper Brioverian (Briovérien Supérieur) rocks are described as turbidite - flysch deposits (greywackes) with flute and bounce casts and groove and drag marks, steeply folded about c. NE - SW axes, and can be seen between Domfront in the south to May-sur-Orne in the north around Laize-la-Ville (Doré et al, 1987, p. 28). They are similar to the turbidite - greywackes of the Jersey Shale Formation being deposited in an uplifted, former island arc-basin province in the 'Golfe Bocain' which was situated between the 'Constantien' land area to the north (around Coutances) and the 'Mancellian' land area to the south (south of Vire) (Doré, op. cit. p. 12). The only volcanic sequences are the pillow lava basalts (Spilites de Vassy) at Vassy to the east of Vire. These depositional environments of the island arc area with its axis between Coutances and St. Lô are linked to the subduction of oceanic lithosphere from NW - SE (Doré et al. 1987, p. 11). After the Cadomian folding and uplift (epeirogenesis), the intrusion of the Mancellian granodiorite (560-540 Ma) in the southern Mancellian Terrane, and the deposition of ignimbrites cropping out around St. Germain-le-Gaillard in the north, the area was submerged during the Cambrian transgression around the 'Mancellian high' and high land shown to the west in the Jersey area. In the Cotentin, above the Cadomian 'pedeplaine' (op. cit. p.13), there is a molasse conglomerate overlain by limestones with excellent fossil stromatolites, followed by shales ('schistes and argillites') northwest of Laize-la-Ville near May-sur-Orne, now preserved in a c. NW-SE syncline within the Brioverian. South to Clécy we cross from the Brioverian shales into Cambrian sandstones ('Grès de Caumont') at Caumont, with shales at Le Pont de la Mousse and limestones, les Calcaires de Laize around Clécy. Uplift then allowed erosion of the Cambrian which was followed by the Ordovician transgression which produced sandstones (Le Grès Armorican) overlain by the fossiliferous shales of Les Schistes du Pissot at Mortain, and those at Le Pissot (near Domfront) in the south. These were then overlain by Le Grès de May in the south and the north, followed by shales (les Schistes du Pont de Caen) just north of Domfront. To the north, a limestone La Calcaire des Vaux (used as 'marble' during Roman times in the town of Le Vieux-La Romaine south west of Caen) was deposited. These are shown as contemporaneous with the lower part of the Tillite de Feugerolles which leads to a very interesting palaeogeographic picture. There are no rocks similar to these in Jersey. 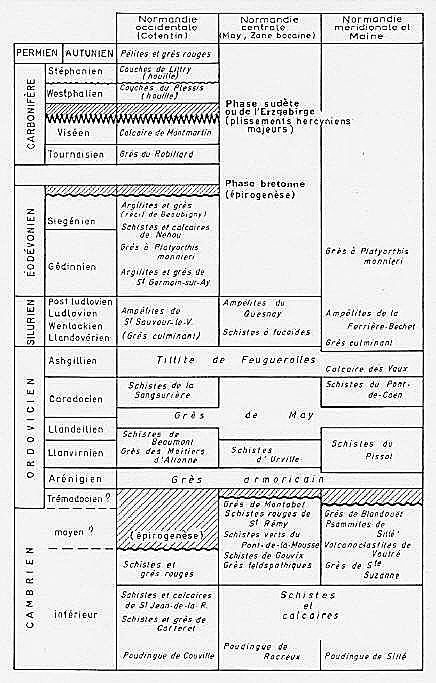 Stratigraphic Succession in west, central and southern Basse Normandy (Doré, et al 1987, p.13). Silurian rocks in the WNW-ESE striking syncline south of May-sur-Orne and Falaise are organic shales (ampelites) and ferruginous shales with an almost complete graptolite sequence. Again, there are none of these rocks in Jersey. The shale-ampelite deposition continued into the Devonian and then there was a widespread change to deposition of sandstones. Rocks of these systems crop out along the coastal areas in the northern part of the Cotentin from opposite Jersey to Cherbourg and in the sea bed of the intervening channel - La Déroute. 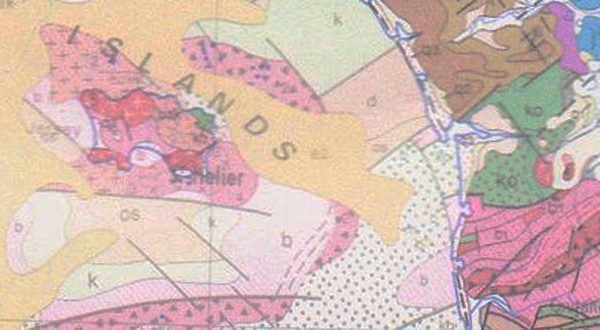 As it is some 40m deep it would seem that these younger rocks have been rift faulted between the Cotentin and the Channel Islands (see below), indicated on the Geology of France (map) but not in the Geology and Geodynamics of France (Dercourt, 1998, p. 291). None of these rocks has counterparts in Jersey, but it would be interesting to visit a small outcrop of ignimbrites around St. Germain-le-Gaillard, c. 15km north of Carteret. The sea floor rocks (IGS & BGMR,1976; and BGMR, 2003) in the intervening La Déroute channel, are Brioverian rocks in the south overlain northwards by Cambro-Ordovician conglomerates, Ordovician-Silurian, and Devonian rocks which are possibly extensions of the coastal outcrops mentioned above. These are followed northwards again by Cambrian rocks and Cambro-Ordovician conglomerates (the only rock unit symbol given on the map). These adjacent channel rocks seem to be situated in fault-bounded troughs and strike NE - SW rather than in a broad syncline. The whole sequence is also shown to be partly trough-faulted between a NW striking fault against the igneous mass of Les Écréhous and a partly inferred fault against the Palaeozoic rocks of the Cotentin. Geology map of Jersey, the surrounding sea bed and western Cotentin, showing rocks of Brioverian (b purple), Cambrian (k green), Cambro-Ordovician (ko green), Devonian (d1-3 brown), Eocene (e yellow) ages, and faults, solid and inferred. The Cotentin coastal folds are not shown to continue SW across the sea floor, but they are similar to the NE striking fold in Jersey's volcanic and conglomerate formations. The key sea floor exposures are covered unconformably by the SE arm of the Eocene limestones along Le Ruau Channel between Jersey and Les Écréhous and Les Dirouilles. Brown, M. Power, G. M. Topley, C. G. & R. S. D'Lemos, R. S. 1990. Cadomian magmatism in the North Armorican Massif. p. 181 - 213, in The Cadomian Orogeny. Eds. D'Lemos, R. S., Strachan, R. A. & Topley, C. G., 1990, Geological Society Special Publication No. 51. Dercourt, J. & Begouën-Batréau, V. (coll.). 1998. Géologie et géodynamique de la France (Outre-mer et Européenne). Dunod. D'Lemos. R. S., Strachan. R. A. and Topley. C. G. Eds. 1990. The Cadomian Orogeny. Geol. Soc. Spec. Publ. No. 51. The Geological Society. London. Doré, F., Larsonneur, C., Pareyn, C., Rioult, M. & Juignet, P. et al. 1987. Normandie Maine; Guides Géologiques Régionaux. Masson. 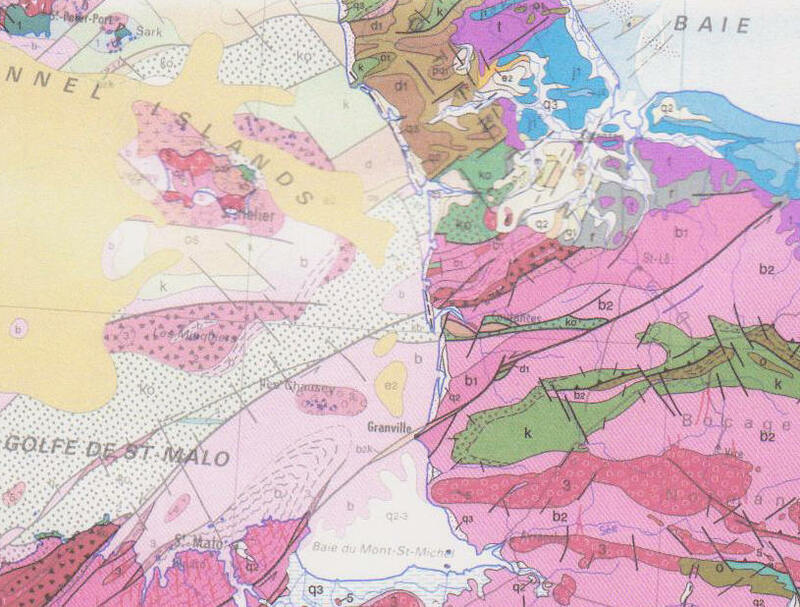 Geology of France 1:1,000,000 map, 2nd ed., BGMR, 2003. Guernsey 1;250,000 Sheet continental shelf map, IGS & BGMR, 1976.